FUKUSHIMA--"I AM DEATH, DESTROYER OF WORLDS"
Now, besides medical emergencies, we have to consider surviving nuclear meltdowns, like Fukushima, to be at the top of the family survival list! 110 Nuclear plants here in the US--all are a threat and many are older, similar plants to Fukushima. Add to the list, chemtrails in the air, fluoride and chlorine in the water and GMOs in the food, and you can see why H.E. Bishop Richard Williamson warned several years ago "Be careful of what you eat and drink, they are poisoning you in the food and water!" This will require a totally different approach to your emergency medical kit. The world has learned from Fukushima and Chernobyl that you cannot depend on the government or the nuclear plant operators to put out honest information that will determine if your family will survive without serious trauma. TEPCO NOW ADMITS THEY LIED BECAUSE THEY FELT THEY HAD TO! Be educated and do your research and prepare now. Nuclear accidents nor incidents happen slowly--they are immediate and your response will need be immediate. Visit www.nukepills.com for information and pricing to order potassium iodide. Don't forget children are 100 x more likely to suffer and infants 1000 x more sensitive. Pregnant women as well. Do not wait for an incident to happen, the time to order is now--tomorrow may well be too late! In the weeks following Fukushima, there was a 40% increase in the incidence of babies born with Congenital Hypo-Thyroidism (dwarfism) in US west coast states. That is a huge increase. Also, there was a shocking increase in deaths in most of the US states that is attributed to Fukushima. The estimates are at 14,000 known and as many as 100,000 total. Yet we hear not a word from the media!! Natural and even man-made disasters can produce situations where Survival Medicine will be not only required but life-saving. The first thing that you will need to do is to assess what situations you may find yourself in and prepare a medical kit for those situations. 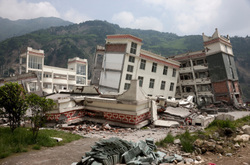 You will also need to determine who may need medical care and prepare for those persons as well. If your family is composed of adults and children or adults and infants then special products need to be included. If your family is composed of adults and seniors your needs will include items that may not be needed by young children. Learning to provide medical care in a survival situation is not much different than learning to provide standard first aid. One thing that we all can do to prepare for a survival medical situation is to take instructional classes from the American Red Cross. General First Aid, CPR, and Infant resuscitation are just a few of the classes available. There are classes for all age groups and skill levels. Once you have received some first aid training, you can begin to assemble your family’s survival medicine kit. Every home, school and office should have some type of first aid kit. Survival medicine at times may be nothing more than common sense. A small cut will need to be washed in soapy water and covered. In a survival situation, safe water for drinking and hand washing may be in short supply. Hand sanitizer is a good temporary water replacement for small injuries. Placing water purification tablets in your first aid kit will provide clean and safe water for drinking and cleaning wounds and prevent secondary conditions such as infection and diarrhea. Keeping anti-diarrhea medications in your survival medical kit will help keep everyone hydrated. 911 may be out of the question! High calorie/protein foods or supplements will be needed in a flood prone area. Escaping fast rising water will leave little time for proper food packing so keeping supplement bars, vitamins and high calorie replacement bars in the first aid kit will help out in an emergency. People living in fire prone areas might be exposed to toxic smoke and fumes and will need specialized medical supplies in an emergency. Respirators to help filter the air, burn creams and gauze, as well as chemical single-use ice packs should be part of any survival medical kit for fire-prone areas. Suggestions from an EMT for packing First Aid Kits. Get a pad of paper-you will want to make notes. Survival medicine does not need to be fancy, just functional. Pre-made kits provide a wide variety of items that are all useful but they may not include those special items that your particular area will require. 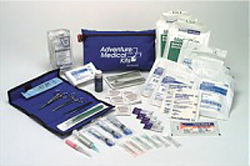 Placing a purchased kit inside a bag with a home assembled survival medicine kit gives you the added peace of mind that you have prepared for the types of medical emergencies that you may face. This practice also allows you to include prescription medication that members of your family may require. Preparing your own survival medicine kit means that you will also have the over the counter (OTC) items that your family uses regularly. If your family has infants or small children you need to keep items such as teething gels, analgesics for infants/toddlers/children, diaper rash cream, any prescription medicine that is taken daily and pediatric sized splints and bandages in your survival medicine pack. Senior citizens have specialized problems as do middle aged adults. Arthritis and diabetes are two common problems that many of those population groups are faced with. Keeping glucose tablets or gel in your survival medicine kit pack at the office as well as the one at home may prevent complications from diabetes in a survival situation. An extra bottle or two of ibuprofen or acetaminophen would allow for less discomfort and more mobility. In any survival situation an extra set of hands is invaluable. By planning ahead for the types of survival medicine situations that may affect you and your family you’ll find that you have removed a lot of stress that comes from being faced with a difficult situation.